Phenomenex has announced Kinetex F5 – a robust pentafluorophenyl propyl (PFP) core-shell phase that overcomes reproducibility and performance limitations of existing PFP and F5 products on the market. After extensive internal and external testing found that existing PFP and F5 fully porous and core-shell products produced sporadic basic compound adsorption and analyte retention time shifting, Phenomenex, in partnership with customers, developed this new core-shell pentafluorophenyl. The new Kinetex F5 phase delivers improved reproducibility and can significantly reduce method development time with its dynamic and responsive chemical functionality. It is an ideal solution for HPLC/UHPLC development work with its combination of polar and non-polar interactions including hydrogen bonding, electrostatic, hydrophobic, aromatic and steric/planar mechanisms. Additional versatility of this phase gives scientists the ability to use reversed phase, 2D-LC, HILIC, SFC or even 100% aqueous separation modes. With its fluorinated groups and carbon ring structure, the Kinetex F5 is an excellent choice for both polar and non-polar compound separations as well as challenging methods that include halogenated, conjugated or isomeric compounds. 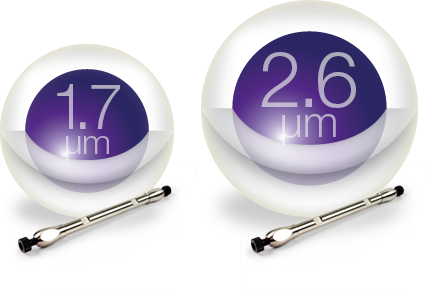 Kinetex F5 is available in 2.6 and 1.7 µm particle sizes and delivers all the advantages of Phenomenex’ Core-Shell Technology including better resolution, higher efficiency, easy method transferability and cost savings from reduced solvent consumption. The Kinetex 2.6 µm F5 provides performance comparable to sub-2 µm particles on both standard HPLC and UHPLC systems. The 1.7 µm column delivers 20 percent greater efficiencies than fully porous sub-2 µm products.